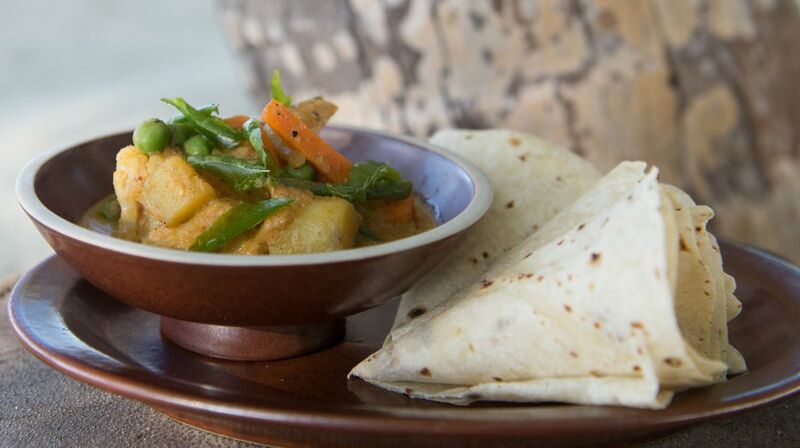 With Indian influences and popular amongst Muslim communities in Southern Thailand, Massaman curry is a truly global dish. This vegetarian and vegan version is simplified for American cooks, but still has a distinct kick from the unique combination of spices: ginger, turmeric, cinnamon and a bit of sugar and especially the Chinese five-spice powder. Yes, I know it sounds odd, but give it a try and see if you don't just like it as much as I do! Traditional Thai Massaman curry ingredients are chicken and potatoes, which is why this vegetarian version uses seitan, but if you want to add veggies, try baby corn or green peas. Or, instead of the seitan, pick up a chicken substitute from the grocery store. Gardein is one popular brand, and Beyond Meat strips also get high reviews, but any kind of vegetarian meat substitute you like will work just fine, even plain tofu in place of the seitan. Reprinted with permission from The Daily Vegan Planner. In a large skillet or stockpot, heat five-spice powder, ginger, turmeric and cayenne in oil for just one minute, stirring constantly, until fragrant. Reduce heat to medium-low and add coconut milk and vegetable broth, stirring to combine. Add potatoes, seitan, cloves and salt, cover, and cook for 15-20 minutes, stirring occasionally. Uncover, add peanut butter, cinnamon, sugar and peanuts or cashews, and heat for one more minute. Serve over rice (or another cooked whole grain, if you prefer). If you prefer a thicker vegetarian Massaman curry, dissolve 1 tablespoon cornstarch in 3 tbsp water and add to curry, simmering for 2-3 minutes, until thick.